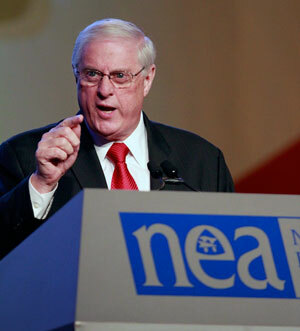 Home » Education Reform » Dennis Van Roekel’s farewell speech as NEA president: End blame. Bring equity to our schools. Dennis Van Roekel’s farewell speech as NEA president: End blame. Bring equity to our schools. Outgoing NEA national president Dennis Van Roekel presents a critique of the last generation of counter productive education reform grounded in the reality experienced by our students. He goes on to offer a vision for the role the nation’s largest teachers’ union should play in the future. changed the education conversation totally. But the largest transformation in my time began 31 years ago. The year was 1983, and something happened that year that changed the conversation totally. A new report was published entitled “A Nation at Risk: The Imperative for Education Reform.” In all my life as a student and as a teacher, this was the first time that public education was ever labeled as the problem, not the solution. We were the problem, not the solution. The very institution that was revered as the foundation of democracy, the driver for equity, was now labeled as a national liability. What a difference. After Sputnik, Congress passed the National Defense Education Act. by a rising tide of mediocrity. When our country was behind, when we needed to really move forward, they invested in education. But that wasn’t the theme of “A Nation at Risk.” They report began with five simple words, “Our nation is at risk.” And the introduction went on to make sure it gained immediate attention, and it did. They said public education was being eroded by a rising tide of mediocrity. But the one that so struck me, they said “if an unfriendly foreign power had attempted to impose on America the mediocre educational performance that exists today, we might well have viewed it as an act of war.” Those are strong words. And as a newly elected state president, as an educator, I never once dreamed at that time how one event could impact events for years to come. Now, actually, the report had some very solid recommendations, but they were mostly ignored. Instead of what was in the report and in the name of “reform,” ideas and recommendations materialized that were never even mentioned in the report – vouchers, tax credits, privatization, merit pay, a whole new generation of so-called reforms. NEA responded, and we began an important transformation. We realized that if political leaders were going to abandon their role as advocates and protectors of public education, then we must do that…we must be the advocates and the protectors. In all of our history, we have always advocated for ways to improve education, but now we had to fight for the very existence of public education. As public education policy shifted from leveling the playing field into turning education into a competition with winners and losers, we needed to become the champions of equity, to define solutions that drive excellence and success for all students. The report “A Nation at Risk,” was the beginning of an attempt to totally redefine America’s system of public education. First, they labeled public education as a failure, a liability. And then in 2002, they lowered the boom with No Child Left Behind. Now, this was passed with overwhelming support from both Democrats and Republicans, but No Child Left Behind became an insidious tool used to undermine and attack public education. It’s been driven by mandatory high-stakes testing in grades three through eight. It became the mechanism for labeling and blaming public education, and by establishing a flawed measure of success–Adequate Yearly Progress, politicians created the means, the opportunity for corporate reformers to remake public education into a whole new source of profits that would be gathered at the expense of students. And now where are we? And so now, 12 years after No Child Left Behind, where are we? These politicians and their policies have created a difficult environment for students and educators, delegates. You know clearly the issues that have become part of our daily lives and discussions: intense dissatisfaction with the conditions of learning and teaching, the need for more time in almost everything we do, time to teach, time to learn, time to plan, and time to collaborate with colleagues as we deal with all of these new demands placed upon us. Our lives revolve around testing. The issue of privatization of more and more jobs of our education support professionals. The intrusion of for-profit players, both in higher education and K-12. Especially troubling is the increasing influence and control of huge corporations like Pearson and others. And the incredible onslaught of corporate reformers like Democrats for Education Reform, Michelle Rhee, and the like. Attacks on educators’ rights and even attempts to silence our voice. And if that were not enough, our lives revolve around testing–the overwhelming amount and the offensive misuse of scores from high-stakes standardized tests. For the delegates in this hall, for our members back home, the feelings generated by these and other issues are strong and they are real. I’ve seen them. I’ve heard them from you. And I share them with you. Feelings of anger, frustration, disappointment, and unrealized expectation of the Department of Education. Whether student, active, retired, whether higher ed, ESP or teacher, it doesn’t matter. We are all impacted and demoralized by these attacks. And your feelings are totally justified. I mean, really, 12 years is plenty long enough to evaluate their strategy of mandatory testing and test-based accountability. Plain and simple, their strategy has failed America’s students, especially students who are poor and students of color. And I say to you that it is simply not acceptable to continue down this path. The direction must change? Am I right? Am I right? We're at another milestone in our history. As an organization, public education, we’re at a critical point. We’re at another milestone in our history. You know, I guess getting older does have some advantages. It has allowed me to see and to experience many different things. And I can tell you that living through “A Nation at Risk,” No Child Left Behind, and the increased intensity of corporate reform, I have seen so many examples of injustice in our systems, and the negative impact on students. When I think of the 10 years preceding No Child Left Behind, I wish I could go back and do things differently. If I had only understood then what I understand now. You see, all of us in the education family–all of us–we knew the system was not fulfilling the promise, not fulfilling the promise for all of its students, not doing what they needed, and we allowed the politicians of the day, Congress, to define the solution, and their solution was No Child Left Behind. Now, I want to state something very clearly. We, the NEA, cannot allow politicians to define the terms of change and accountability for yet another generation of students. We cannot let that happen again! We, the educators, must define the solutions and we must lead. But what I want most is for us to choose the right strategy, the right leverage points to actually create and design something new, to chart a course that can deliver on our mission to fulfill the promise of public education, to prepare every student to succeed. And deep down, way deep down in my gut, I know that the only way to combat their strategy is a strategy that is creating the most equitable system of education in our nation’s history. We must create a counterforce that creates us toward equity. And we cannot do that without a student-centered strategy that is led by this union–just like the days when our association was transforming, transforming into an organization deeply committed to social justice, deeply involved in collective bargaining and politics. This transformation will also be rocky and at times even controversial. New partners, new strategies, new priorities, and new policies will be required. Oh, yes, there will be pushback. Yes, there will be struggle and, yes, there will be progress. There must be progress. A strong future for public education for our association depends on leading an agenda focused on student success and educator quality, not as an afterthought, but as our first priority. Equity, excellence, and accountability for the whole system. That must be our focus and our agenda. You see, as we are all so painfully aware, the current accountability system–as they call it– is totally driven by high-stakes standardized tests. But when it comes to tests and testing, let’s be clear, we as educators are not opposed to tests. Good gosh, we invented them and we use them every week in our classrooms, but we also know the purpose of the testing should be to drive learning, not label in punishment. And most of all, and most of all, we understand that the misuse and abuse of test scores harms students. It is indefensible to use test scores to evaluate all teachers when only 30 percent of teachers actually teach the subjects tested and the students who take the test. And you cannot cover it up with value-added models. It is absurd to believe that using bad data from multiple years will somehow magically be converted into good data. Research says, no, not possible. And no matter how good a test is, no matter how well-designed, if the results are used improperly, it will result in bad decisions, period. Now, in all of this mess, the good news is, there is growing evidence that points to one conclusion. This current so-called accountability system is crumbling. And I believe it is not a question of if it will crumble. The only question is when. From every direction, the pressure is building. Parents opting out more and more because they see it’s not helping their student, it’s not helping them, and it’s not helping the teacher. Superintendents banding together saying enough is enough. This is crazy. State legislators, legislatures one by one, taking action saying we are not using these test scores for high-stakes decisions. You know, research on a weekly basis has slammed these value-added models of being unreliable and totally wrong for what they’re using them for. You see, people tend to look back and glamorize the days of old. The more time passes, the more we forget the realities of that time. So just how great was it in the year 2000 for all of the students in America? We were graduating about 70 to 75 percent, unless you were African American, Hispanic, or Native American, then in many places it was only 50 percent. So the truth is for me, 2000 was not the good ol’ days. It was not good enough, not anywhere close. But think of this, if we are successful, if we are able to sweep this whole high-stakes standardized test-based accountability system aside, we sweep it off the table, what then? I figure there will be a vacuum, a void for one nanosecond, and then somebody is going to put an idea on the table. And what we must ensure is that we don’t allow another bad idea to replace No Child Left Behind that we have to fight for the next decade. The price for students is too high. We, we the educators, the National Education Association, we must define a better solution to set on the table and say this is what we need to talk about. We must be all about creating an alternative, one that redefines equity and excellence and demands accountability for the whole system, a system that is designed to focus on equity, not test scores. And the way we need to begin is to redefine excellence. Individual excellence should never be defined as performing at minimum levels. Individual excellence should be about pushing personal limits, rising up. In my classroom, in my coaching, I always told my students no matter how good you are today, tomorrow you can be better. We need to have that as our definition of individual excellence. When it comes to defining excellence for a school or a college, what it should be is to set high expectations for all learners, but here is the shift. The definition of success for a school is establishing high standards for all students and then trying in every way possible to help students reach them. You see, it’s not about the test scores. It’s not about ranking, labeling, and punishment. It’s about doing everything possible. I get so upset when they list the test scores and they are saying how low they are and then they think they’ve done their job. No? That’s the first step. Once you identified those that do not have what they need, what I want to know is, what are you going to do about it? What are the solutions you’re proposing? This is a major shift. Accountability just isn’t about what the scores are. It’s about what we do in every way possible to lift them up for all students to succeed. See, this is about equity. It’s about equity. And I submit to you that you cannot achieve equity by only looking at test scores or blaming educators or destroying the profession and pretending that due process is the problem. I mean, come on. To all the misguided reformers attacking education, I say this, if you truly care about kids, then use your resources to help students instead of attacking educators. If you truly care about kids, if you are serious about what you say, then help us change the system. Don’t change the system that too often denies excellence for students who are poor and students of color. Use your resources and demand accountability for the whole system, not just a part. Demand accountability for equity. You see, when you start attacking the cause of failure and demand accountability for the implementation of solutions, the whole world changes. Now, what do you say would change? How would you create accountability for a system or accountability for equity? I think you have to start with school readiness. I know of no family of means that denies early childhood education to their children, yet we’re in an America that denies early childhood education to its kids? Why do we feel it’s important for other people’s children and not for all of our children? We need accountability for the conditions of learning and teaching. spend it on the learning conditions of students. I was so honored to go with the president of NJEA to visit schools in New Jersey. I remember a school that we visited in Trenton. It’s a school with two floors plus a basement, 300 kids in that school. There were two bathrooms. One for the boys and one for the girls in the basement. The hallway in the basement, it was about seven feet wide, and that’s where the kids went down the hallway to pick up their lunch off a table and then into this dingy room they called multipurpose lunchroom, P.E. room. Can you imagine having P.E. in a room where there are posts down the center and the ceiling is seven feet high? It’s really hard to play volleyball in there. It’s absurd. The worst part of the story, they always hoped it didn’t rain before lunch. Because when it rained, the hallway flooded. It is an outrage that our society allows children to suffer such injustices. It’s 2014. Instead of spending billions on toxic tests, instead of spending billions on test corporations and their consultants, spend it on the learning conditions of students. You know, the best surgeon in the world, if you take him or her out of the operating room, a sterile environment, good lighting, talented nurses, anesthesiologist and put him in a battlefield, they are still the best surgeon, but they can’t get the same results. And to those people who say that learning conditions don’t make a difference, you’re just wrong. And thank goodness for NJEA and their efforts to change every school in New Jersey to have the kind of learning conditions that students deserve. There is another area in this push for equity that I think is critical. It has to do with high standards and the quality of educators. See, I just can’t imagine how you can achieve equity without having high standards for all learners, delivered by well-trained, certified, and licensed professionals. Our system today is separate and unequal. It is a race and class-based system that drives decisions on resources and supports. Sixty years after Brown v. Board we know which kids year after year are cheated, and it’s poor kids and students of color. Whether it’s Common Core State Standards or other state standards, if they are flawed, then we must create a process to refine them and make them better. But what we cannot allow is a system or support a system that is designed to be inequitable–inequitable in expectations or the resources needed to provide the support students need. When it comes to a quality workforce, that is our responsibility, too. We are a part of the system and we must take ownership of and responsibility for the quality of educators who serve our students every day. You see, there are those on the outside who are really trying to change that. Their vision for our professions–all of our professions–is very different. You see, one thing I believe about people is they don’t behave inconsistently. If they appear to be inconsistent, then you haven’t found the common thread yet. And when I look at all the things they do, all of their strategy, their theory of success can be defined very simply. What they want is little or no training for any of the jobs in education, because that drives down the value and the wages of work. And if you have low wages and low respect or value, that drives high turnover. And if you have high turnover, you don’t need pension plans and you won’t have a union because they can’t replenish their membership every three to five years. They want to drive down wages, respect, and value and turn those savings into corporate profits. There is nothing they do that doesn’t fit that theory of success. who have students with the greatest need. The other day I was talking to a reporter, and they like to talk about performance-based pay. The reporter said to me, “Dennis, don’t you think good teachers should be paid more than bad teachers?” I said, “No! I don’t think bad teachers should be paid anything! They shouldn’t be there!” What kind of crazy world do we live in when their solution is to let anybody in and then just make it easy to fire all your mistakes? The solution is not to let anyone in who is not profession ready on day one! It is so confusing to me to understand their logic. You know, we hire licensed contractors, doctors, lawyers, barbers, architects, plumbers, electricians, why in the world would you allow an untrained, uncertified, or unlicensed person to be in charge of 30 to 35 students? It is wrong. It is indefensible. It is malpractice. And you know the worst part, we know exactly where these unlicensed, uncertified, or out-of-field teachers are placed. They are placed in schools who have students with the greatest need. And why does the system continue to allow it year after year? Why do we tolerate a system that continually denies opportunity and equity for the same group of students? It is our professional responsibility to demand change. And as they strive to lower standards, to deprofessionalize all of our professions, we must come out stronger for higher standards. We must demand a performance-based assessment for all potential educators to be licensed to practice our professions. Shortchanging teacher candidates on preparation, plain and simple, shortchanges students. High standards for all students, professional licensure requirements for all educators, must be part of an accountability system for equity. read the whole speech at NEA – Dennis Van Roekel: Bringing Equity to Schools Requires Leadership, Not Just Action. By ANHPE in Education Reform, Improving Education on July 4, 2014 . Van Roekel’s article is a detailed review of education policy since 1983. He highlights several pitfalls and some possibilities for the future. Despite the testing, the vouchers and the blaming; Van Roekel gives reason to work together toward “equity, excellence and accountability” and a commitment to public education.